A peptic ulcer, also known as peptic ulcer disease, is an erosion in the wall of the stomach, duodenum, or esophagus. 70–90% of peptic ulcers are associated with Helicobacter pylori, a spiral-shaped bacterium that lives in the acidic environment of the stomach. Diagnosis is mainly established based on the characteristic symptoms. Stomach pain is usually the first signal of a peptic ulcer. Treatment of H. pylori usually leads to clearing of infection, relief of symptoms, and eventual healing of ulcers. Gas in the peritoneal cavity, shown on an erect chest x-ray or supine lateral abdominal x-ray, is an omen of perforated peptic ulcer disease, which requires emergency surgery. Most bleeding ulcers require endoscopy urgently to stop bleeding with cautery, injection, or clipping. During the active phase, the base of the ulcer shows 4 zones: inflammatory exudate, fibrinoid necrosis, granulation tissue and fibrous tissue. A gastric peptic ulcer is a mucosal defect which penetrates the muscularis mucosae and muscularis propria, produced by acid-pepsin aggression. Ulcers are not purely an infectious disease and that psychological factors do play a significant role. Gastric ulcers are most often localized on the lesser curvature of the stomach. Gas in the peritoneal cavity, shown on an erect chest X-ray or supine lateral abdominal X-ray, is an omen of perforated peptic ulcer disease. Burning or gnawing feeling in the stomach area lasting between 30 minutes and 3 hours commonly accompanies ulcers. Typical ulcers tend to heal and recur and as a result the pain may occur for few days and weeks and then wane or disappear. prostaglandin: Any of a group of naturally occurring lipids derived from the C20 acid prostanoic acid; they have a number of physiological functions and may be considered to be hormones. NSAID: Any drug of the non-steroidal anti-inflammatory class used as a pain reliever. gastritis: Inflammation of the lining of the stomach, characterized by nausea, loss of appetite, and upper abdominal discomfort or pain. A peptic ulcer, also known as peptic ulcer disease, is an erosion in the wall of the stomach, duodenum, or esophagus. As many as 70–90% of such ulcers are associated with Helicobacter pylori, a spiral-shaped bacterium that lives in the acidic environment of the stomach. Ulcers can also be caused or worsened by drugs such as aspirin, ibuprofen, and other NSAIDs. 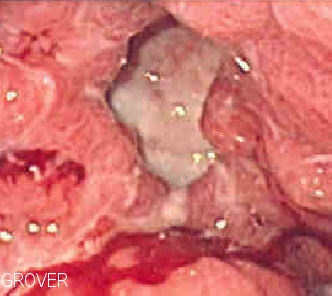 Deep gastric ulcer: This image, acquired via endoscope, shows a deep gastric ulcer. Symptoms of a peptic ulcer include abdominal pain, classically near the stomach with severity relating to mealtimes, about three hours after eating a meal; bloating and abdominal fullness; nausea; copious vomiting; loss of appetite and weight loss; vomiting of blood; and melena, which are tarry, foul-smelling feces due to oxidized iron from hemoglobin. 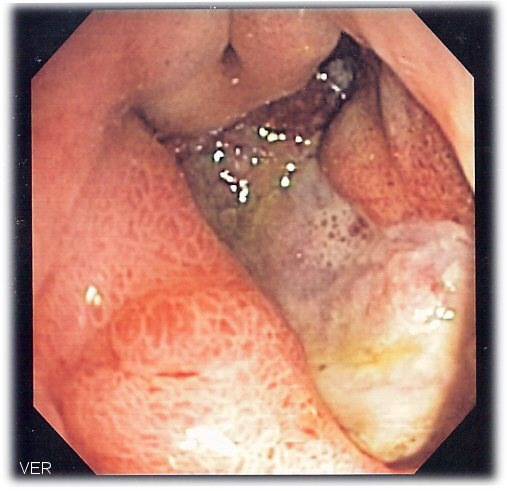 Rarely, an ulcer can lead to a gastric or duodenal perforation, which leads to acute peritonitis. This is extremely serious and requires immediate surgery. A major causative factor of ulcers is chronic inflammation due to Helicobacter pylori that colonizes the mucosa. The immune system is unable to clear the infection, despite the appearance of antibodies. Thus, the bacterium can cause a chronic active gastritis, resulting in a defect in the regulation of gastrin production by that part of the stomach. Gastrin secretion can either be increased, or as in most cases, decreased, resulting in a too basic or too acidic stomach environment, respectively. A decrease in acid can promote H. pylori growth and an increase in acid can contribute to the erosion of the mucosa and therefore ulcer formation. Another major cause is the use of NSAIDs. The gastric mucosa protects itself from gastric acid with a layer of mucus, the secretion of which is stimulated by certain prostaglandins. NSAIDs block the function of cyclooxygenase 1 (cox-1), which is essential for the production of these prostaglandins. Gastric ulcer: This endoscopic image shows a gastric ulcer, which upon biopsy was shown to be gastric cancer. Confirmation of the diagnosis is made with the help of tests such as endoscopies or barium contrast x-rays. The tests are typically ordered if the symptoms do not resolve after a few weeks of treatment. Tests are also given when first appear in a person who is over age 45 or who has other symptoms such as weight loss, because stomach cancer can cause similar symptoms. Also, when severe ulcers resist treatment, particularly if a person has several ulcers or the ulcers are in unusual places, a doctor may suspect an underlying condition that causes the stomach to overproduce acid. Benign gastric ulcer: This gastric ulcer was found in tissue removed during a gastrectomy. Younger patients with ulcer-like symptoms are often treated with antacids. The ability of antacids to neutralize acidity by increasing the pH or blocking the secretion of acid by gastric cells is critical in reducing acidity in the stomach. Patients who are taking NSAIDs may also be prescribed a prostaglandin analogue in order to help prevent peptic ulcers by replacing the prostaglandins whose formation is blocked by NSAID use. When H. pylori infection is present, the most effective treatments are combinations of two antibiotics, such as Clarithromycin, Amoxicillin, Tetracycline, and Metronidazole; and one proton pump inhibitor, sometimes in combination with antacids. In complicated, treatment-resistant cases, three antibiotics may be used together with a proton pump inhibitor. Treatment of H. pylori usually leads to clearing of infection, relief of symptoms and eventual healing of ulcers. Recurrence of infection can occur and retreatment may be required, if necessary with other antibiotics.